Way back in 1981 many of us has the pleasure of playing the multi-directional arcade shooter of 'Bosconian', which was developed by Namco and put you in control of a space ship to score as many points as possible by destroying enemy missiles and bases while also avoiding asteroids, mines and other such ship destroying objects. If you remember that awesome game you'll be pleased to know the Atari 2600 arcade clone of 'Draconian' has reached a public build version RC6 and will be finished very soon! Developed by SpiceWare, they have really raised the bar in the homebrew community with Draconian and it just goes to show with more effort, games can be just as good if not better than what was released during the systems golden age. It isn't just the classic graphics of the Atari 2600 you'll love, but this game has gameplay that is as good as some modern indie games released even today. 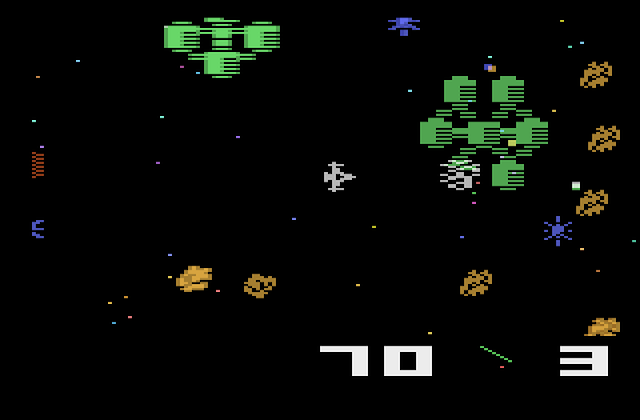 But for those of you without an Atari 2600, load up an emulator and give this game a go, it's well worth playing!